1 Matthew Cave, MD, University of Louisville, Division of Gastroenterology and Hepatology 2 Cave, Toxicologic Pathology, 41: 343-360, 2013 3 Rajdl D, Racek J, Trefil L, Stehlik P, Dobra J, Babuska V. Effect of Folic Acid, Betaine, Vitamin B6, and Vitamin B12 on Homocysteine and Dimethylglycine Levels in Middle-Aged Men Drinking White Wine. Nutrients. 2016; 8(1):34.
body’s ability to detoxify, your genetic predisposition to disease as well as your intake of alcohol and other medications and/or supplements. An individual’s susceptibility to chemically-induced liver disease is determined by polymorphisms in the genes of xenobiotic metabolism, concomitant use of alcohol or prescription medications, nutritional factors, and obesity.2 Finally, if you’re looking to combat your alcohol intake, enzymes and B vitamins may be your answer but as always check with your physician before starting or adding to your supplement regimen. 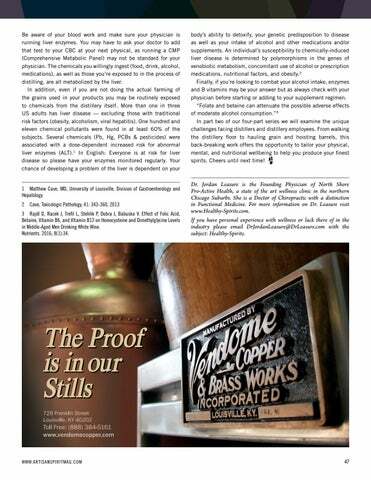 “Folate and betaine can attenuate the possible adverse effects of moderate alcohol consumption.”3 In part two of our four-part series we will examine the unique challenges facing distillers and distillery employees. From walking the distillery floor to hauling grain and hoisting barrels, this back-breaking work offers the opportunity to tailor your physical, mental, and nutritional wellbeing to help you produce your finest spirits. Cheers until next time! Dr. Jordan Leasure is the Founding Physician of North Shore Pro-Active Health, a state of the art wellness clinic in the northern Chicago Suburbs. She is a Doctor of Chiropractic with a distinction in Functional Medicine. For more information on Dr. Leasure visit www.Healthy-Spirits.com.  If you have personal experience with wellness or lack there of in the industry please email DrJordanLeasure@DrLeasure.com with the subject: Healthy-Spirits. 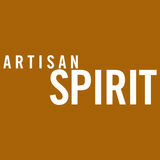 The magazine for craft distillers and their fans.